After detoxing your body and mind the holistic way, nothing beats the physical process of a detox when done at Bohemian Med Spa. Blending natural, holistic practices with medical grade spa treatments, I paid a visit to the Etobicoke spa, spent the day detoxing and left feeling like a million bucks. Fast forward two weeks, and I can truly still see and feel the results; my step is lighter, my face is glower, and my skin is taught and toned. Every detail during my experience seemed carefully thought out, and I thoroughly enjoyed both the spa itself and the process. From the friendly, knowledgable, professional staff to the beautiful towels, here’s why I can’t wait to book my next appointment. Owner Khai and her aforementioned well-trained and kind staff ensured I felt comfortable from the moment I walked into the relaxed atmospheric space. Explaining in detail and answering my questions about the process, I was first led to the back part of the spa to an overly comfortable couch and beautifully zen-like open space to receive my first treatment, an Ionic Foot Spa. Detoxing your body by soaking your feet in a tub of water that’s energized with ions, a total body purification is achieved by balancing the body’s pH levels and drawing out impurities. During the half hour process, the water changes colour depending on where the toxins are being drawn out from your body — for example, if the water turns orange, it demonstrates detoxification from the joints, while white foam indicates detoxification from the lymphatic system. The accuracy of the colour change truly astonished me (full disclosure: my water turned yellow, meaning kidney and bladder detoxification; I have suffered kidney stones and was shocked with the water’s correct conclusion). After stepping out of the foot soak, I felt energized and lighter. After giving me a glass of lemon water to down (this would be the first of many, aiding in the process of detoxing) I was ready for my next treatment, a body wrap. This took place in one of the most stunning yet relaxing treatment rooms I have ever been in, bar none. 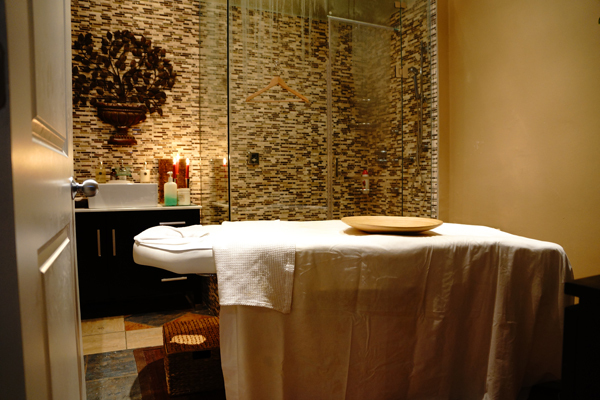 Natural, warm and inviting, I first stepped into a generous-sized shower/steam room hybrid for a 15 minute steam. This was followed by a dead sea salt scrub, which actually felt amazing — part massage, part lymphatic drainage encouragement, the entire body wrap process was administered by a medical aesthetician (the spa also offers a variety of other services, like mani/pedis, that aestheticians provide the services for; each treatment is done by an expert in their own area). After the steam and scrub, it was body wrapping time. 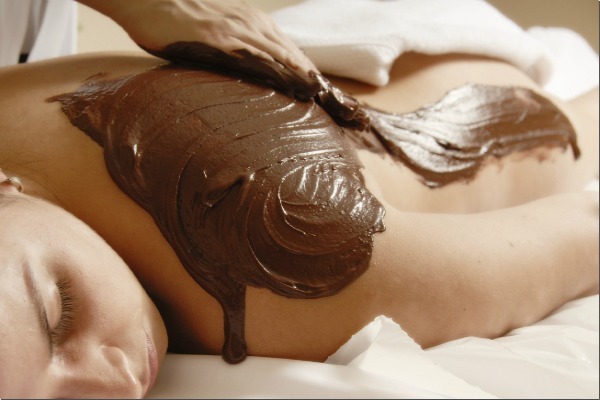 The spa offers both a chocolate wrap and a mud wrap, each drawing out toxins while keeping skin healthy. I went with a chocolate wrap, which packs an powerful antioxidant punch and seriously smooths skin. After painting my whole body with the treatment, which smelled and felt divine, each leg and arm and my chest and stomach were wrapped in ace bandages, then followed by saran wrap on top, which gently compresses and pushes skin into place after toxins are withdrawn, resulting in inch loss. …and hungry. 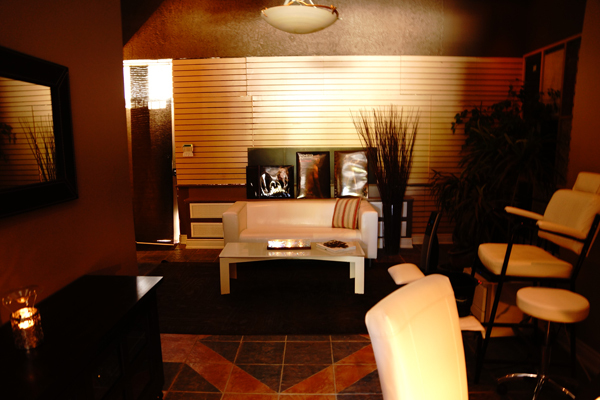 The body wrap treatment is a heavenly three hour treatment, and my lemon-water filled stomach was growling afterwards. Once again, carefully thought out details were taken care of and a delicious chicken salad with goat cheese and cranberries was waiting for me when I stepped out of the body wrap treatment room, compliments of the spa. Light but filling and really good, I was encouraged to take my time and not feel guilty about finishing the generous portion, which I happily did. Satiated and feeling rejuvenated yet peaceful, I was led to a different room for my final treatment, which was micro current – ultra sound and radio frequency technology for a final shot of skin tightening. Not really knowing what to expect, I was pleasantly surprised when the backs of my legs were covered in a thin layer of gel and a round-tipped wand was glided up and down, completely painlessly. On the contrary to what I might have thought, this portion of the day was just as enjoyable as the others. Chatting about beauty, other treatments offered, the spa itself (which has been at its Etobicoke location for two years after previously being in Mississauga for six years under a different name), owner Khai herself administered this treatment, demonstrating her true passion for the spa and its clients. Easy to talk to, she explained exactly how radio frequency technology worked: “the treatment causes fat cells to shrink, while firming-up skin and subcutaneous fascia, to provide a smoother appearance to the skin and decrease the appearance of cellulite. With deep, controlled heating of the fatty layers under the skin, the effects of tissue tightening and increased blood circulation mean that fatty deposits are drained through the lymphatic system, reducing the appearance of cellulite.” True to her word, my skin looked visibly smoother and still does two weeks after my visit. Amazingly, the technology can be used anywhere on the body, including the face, to tighten and tone skin. Truly fair prices, delightful staff and utmost attention to detail are enough reason to return, but the spa’s pulse on the latest and most effective technology that delivers results are what will have me rebooking, stat: a ZOOM teeth whitening system is the latest addition, with more exciting equipment, like a high-tech fat loss treatment soon to follow.